Hundreds of animal activists forced their way onto a Petaluma egg farm Tuesday to raise awareness to what they call the inhumane treatment of chickens. 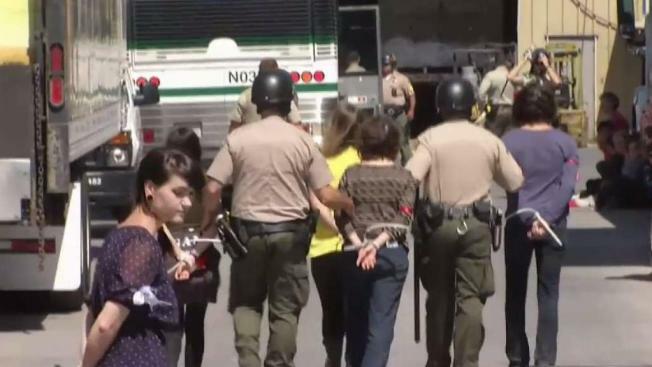 About 40 activists were arrested, according to Sonoma County sheriff's officials. The activists call it one of their biggest actions in the Bay Area as hundreds of them converged on Sunrise Farms in Petaluma, protesting what they said are cruel conditions. "We’re exercising our right to give care to sick and injured animals, dehydrated animals," said Wayne Hsiung of Direct Action Everywhere. A Facebook Live video showed the activists pushing their way inside the facility. They got a look at the birds' living conditions and took out about two dozen chickens. "They were sickly, weak, discolored, covered in filth," said Paul Pseklesimer of Direct Action Everywhere. No officials were available to confirm the conditions of the birds. The activists agreed to leave the property with the hope of negotiating an inspection with the owner. But the negotiations broke down. Dozens of sheriff’s deputies arrived and geared up for a standoff. "There was understading that [the activists] thought they were going to let 20 people in with video cameras, that was not part of the bargain," Spencer Crum of Sonoma County Sheriff's Department said. Later Tuesday, about 40 activists tried walking back onto the farm, only to be arrested. "They can be our friends," Hsiung said. "That might sound crazy, but chickens can be your friend, and if your friend is hurting, you help them." The owner of Sunrise Farms declined multiple requests for comment. In the activist's Facebook Live video, a man who the activists identified the owner of the farm said "There's absolutely nothing wrong in here" and refused to let the activists enter his private property.